See him: Poor James Monroe was quite literally that at the end of his life, reduced to selling his house, moving in with his daughter and pestering Congress to reimburse him for the costs of his diplomatic work decades before. He finally got some of the money, but was too ill to do more than pay off his debts. Monroe died at his daughter’s home in New York City. 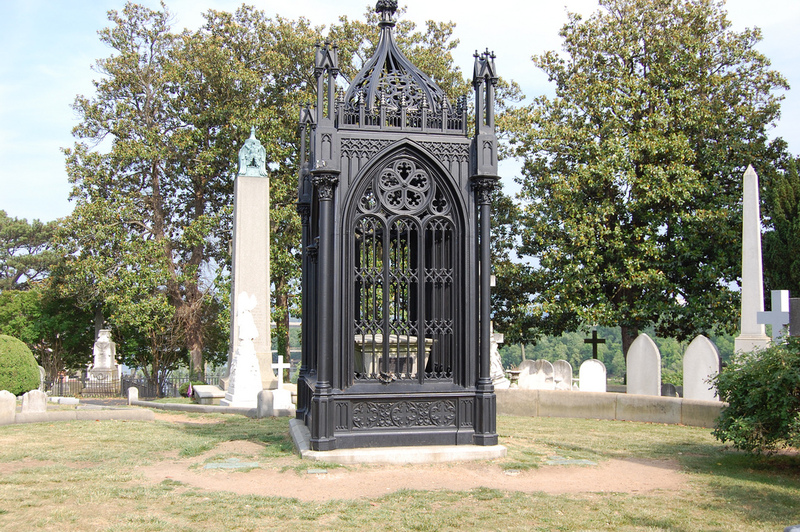 Fast forward a quarter century, when Virginia governor Henry Wise dreams up the idea of a “Presidents Circle” on a hill at Richmond’s Hollywood Cemetery, to house the remains of all the Virginia presidents. The other presidential families decided to stick with their original plans, but Monroe’s family and New York state were amenable to the move, and Virginia lawmakers authorized about two thousand dollars to bring the former president’s casket down the coast by steam ship. Monroe is now at the center of Presidents Circle, just yards away from John Tyler‘s grave and, hopefully, not worrying much about money anymore.